Don't be fooled by cheaper prices, fewer hours or inexperienced instructors. This is the school that people get hired out of. Learn phlebotomy, ekg, medical procedures, medical records, medical billing, real office applications. 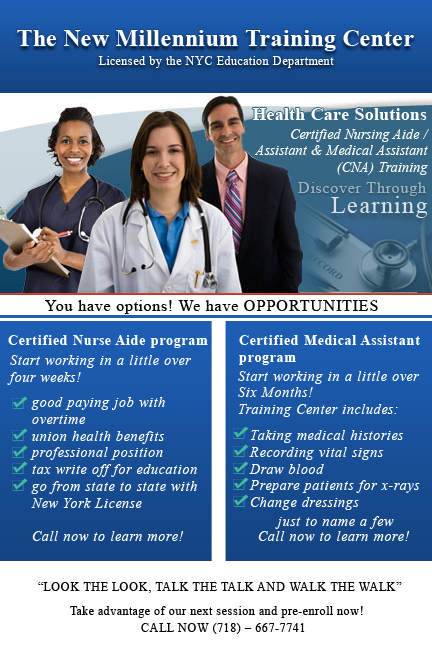 Instruction by veteran New York State Ed Dept Licensed Medical Assistant Teacher with over 20 years of experience. Guaranteed Supervised Externships within our large network of Staten Island's top physicians. 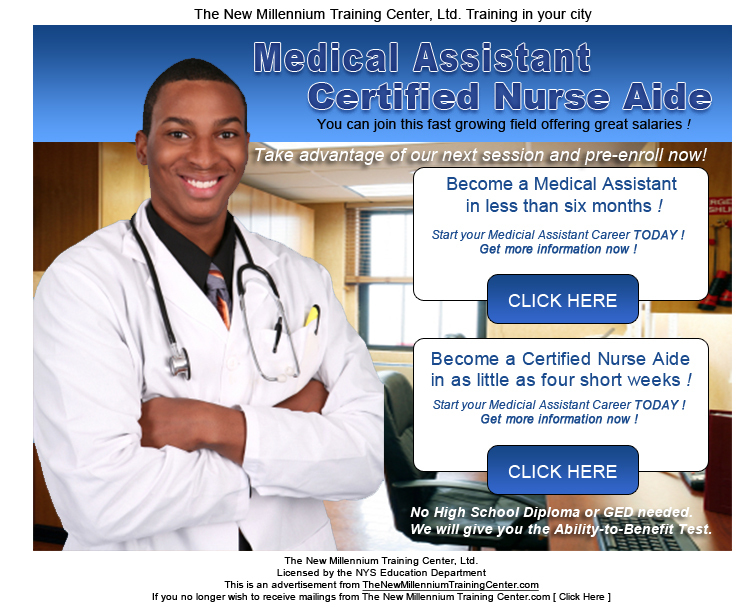 What will I learn during The New Millennium Training Center Medical Assistant course ? Perform basic laboratory tests on premises, dispose of contaminated supplies, sterilize medical instruments, instruct patient about medication and special diets, prepare and administer medication as directed by the physician, authorize drug refills as directed, telephone prescriptions to a pharmacy, draw blood, proper use of multiple phlebotomy needles, vacutainers, tube holders and recording procedures, prepare patients for x-rays, administer electocardiagrams, remove sutures, change dressings, arrange examining room instruments and equipment, purchase and maintain suppliies and equipment, keep waiting rooms and examining rooms neat and clean, allergy skin tests, processing insurance claims, operating a computerized patient management system, scheduling appointments, managing office emergencies, emergency first aid. The United States Bureau of Labor Statistics, or BLS, ranks New York as #5 in the list of top states for medical assistant employment, with between 13,890 and 82,450 medical assistants working in the state. In addition, the BLS reports that the average starting salary for a New York medical assistant is between $36,400 and $42,610, which places the state in the highest range in the country, and well above the national average. Hospital Medical Assistants may earn even more with benefits.
" We are the school where people get hired from "
Its not just a J O B..................................." Its a C A R E E R "
In today’s volatile job market, it’s more important than ever to have an education. Skilled jobs are more secure, offer higher pay and usually come with better benefits. Thankfully, you don’t have to spend four years earning a bachelor’s degree to start such a career. With the right certificate program, you can be trained in as little as six months and still earn a college income! This is a FAST TRACKED program of about 20 weeks in the classroom and then you're actually assisting physicians within their own office and we can't get them enough Medical Assistants. The demand is growing all of the time.The demand for Medical Assistants is exploding. According to the U.S. Dept. of Labor, the Medical Assistant field will create more new job opportunities than any other career through the next decade. Doctors are competing with each other for qualified candidates. Fortunately, our school has more job postings than people to send to them. That's a reputation built on years of good relationships and quality training. There is a special kind of Professional Assistant required for the healthcare field, one that not only has office skills, but also a clinical understanding of the medical field. 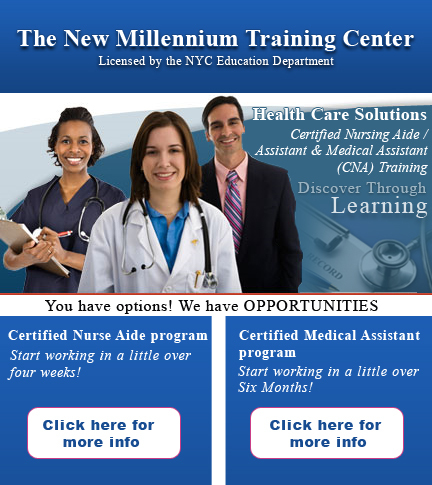 The New Millennium Training Center has created The Medical Assistant Program that will give the knowledge and hands-on training you need to be successful in this field. We will prepare you for a career that is not only financially rewarding but also personally rewarding, helping people as part of a medical team. Healthcare is an exciting, dynamic field, filled with motivated people. There is a way to enjoy many of the career benefits of medical training without the cost and commitment that go along with attending a medical school. As a Medical Assistant, you'll have your finger on the pulse of the medical field. You'll interact directly with both patients and caregivers. You'll help operate and maintain complex diagnostic equipment and also have ample opportunity for growth and advancement. All it takes is the right training and dedication. Because a career as a Medical Assistant comes with great rewards, it also comes with great responsibility. Even though you won't be making diagnoses or prescribing medication, you are the physicians' first line of intelligence and information gathering when it comes to patients. Doctors will be looking to you as the first person in many cases, to interact with a patient for a carefully thought out assessment that will allow them to make the best possible use of their time. You will constantly be learning along with the practice about diagnoses, equipment and office management. In short, what it takes to run a medical practice or clinic. The rewards for a commitment of this magnitude are potentially enormous. You'll be well compensated and in demand. You can choose what part of the country you want to live in and be confident that you will always find medical facilities anywhere you go. Training at The New Millennium Training Center can make you feel good all over. We help our students aquire the skills they need to succeed in the medical field. We have dedicated teaching professionals and we've developed a comprehensive training program that is relatively easy to learn and uses that knowledge during your clinical internship experience. Remember its the school that people get hired out of ....that counts !! "SAVE MONEY... ENROLL N O W !!" Can you see yourself being part of the lucrative Medical Team somewhere? No matter where you go or move to, you'll always have this Certificate of Medical Assisting. Once you get started, career annual salaries and bonuses usually start around 40K-45K and go up periodically, usually with a benefit package. The Mission of the Medical Assisting Program has as its focus, the education of medical assistants who provide services as members of the health care delivery system caring for the sick. It provides an educationally sound, stable environment where a diverse student population has the freedom to learn and grow intellectually as well as develop competencies in administrative and clinical skills. Faculty members are qualified and caring teachers and medical assistant educators who are dedicated to excellence in medical assisting education. The Program in Medical Assisting establishes a technical educational foundation upon which students of medical assisting may continue to build their professional careers. Becoming a Medical Assistant in less than six months! No High School Diploma or GED ? We will give you the Ability-to-Benefit Test. We offer job placement assistance! Take your certification exam with the help of the school! Externship at various doctors offices, hospitals, and medical facilities! We will assist you in preparation for your written Medical Assistant Examination. Ample eateries surrounding the school in a well-lit area. Extremely convenient location to all forms of public transportation, making it accessible from Staten Island, Brooklyn, Manhattan and New Jersey. Students come from all over the city and New Jersey on a daily basis. Work in a professional setting! All applicants for the Medical Assistant program must be 17 years or older. High School Diploma or G.E.D. from any country or its equivalent or education of higher order or Ability to Benefit Exam. in the absence of a high school diploma. The school maintains a staff of representatives responsible for admissions.These representatives are New York State Education Department Licensed School Agents. Prospective students are required to schedule an interview at The New Millennium Training Center with the admission personnel. At this time the representative will gladly explain the school's program in detail. Students must demonstrate a willingness to attend classes on a regular basis and take an active role in the overall program. As a Medical Assistant, you will be a vital part of a medical office's day-to-day operations. You'll get the medical knowledge in such skills as medical procedures, medical billing, medical record, phlebotomy, and electrocardiogram as well as other typical office skills such as patient data entry and office systems applications. With the help from The New Millennium Training Center you will become the Medical Assistant that doctor's rely on to keep their business running smoothly and build their financial bottom line. Medical Assistants perform both administrative and clinical tasks in a medical setting. Medical ​Assistants usually work in physicians or the offices of other medical professionals. Work duties may vary based on the physician's specialty, location, and size. Administrative: answering telephones, greeting patients, scheduling appointments, entering and updating patient record information, and arranging for hospital and laboratory testing for patients. Clinical: collecting laboratory specimens, preparing patients for exams, taking and recording vital signs, assisting physicians in minor office procedures, submitting prescriptions to the pharmacy, and keeping waiting and exam rooms neat and clean. Other: Medical Assistants may also perform tasks for optometrists, podiatrists, dentists, and other specialists. The next factor that impacts salary is the level of responsibility which often correlates to the job title. Salary amounts vary based on years of experience, education, and job location. Although certification is not required for a career as a Medical Assistant, it does indicate to employers that a potential candidate has certain knowledge pertinent to the position which may lead to higher salary and increased responsibility. With experience, the position could lead to advancement opportunities such as a Medical Office Manager. As everyone knows, first impressions are lasting ones. The first impressions your customers receive about your medical practice are often from your office staff making them crucial to the success of your organization. It is helpful to know what skills are important for each position when hiring your medical office staff. Customers of a medical office are not typical customers. They are patients that expect the highest quality of care and some may be in the midst of a medical crisis which requires delicate handling. Not only is it important for the staff to have certain professional skills and strengths, but it is also imperative that they understand that patient lives are reliant on the quality of their work. If you have the desire to help people and be part of a medical team, then The New Millennium Training Center can give you the right training taught by experienced instructors. Besides being in the classroom there is also an internship at various doctors' offices, hospitals, and medical facilities where you will get the hands on opportunities to put your knowledge and training to the test and get that practical experience you need to succeed. 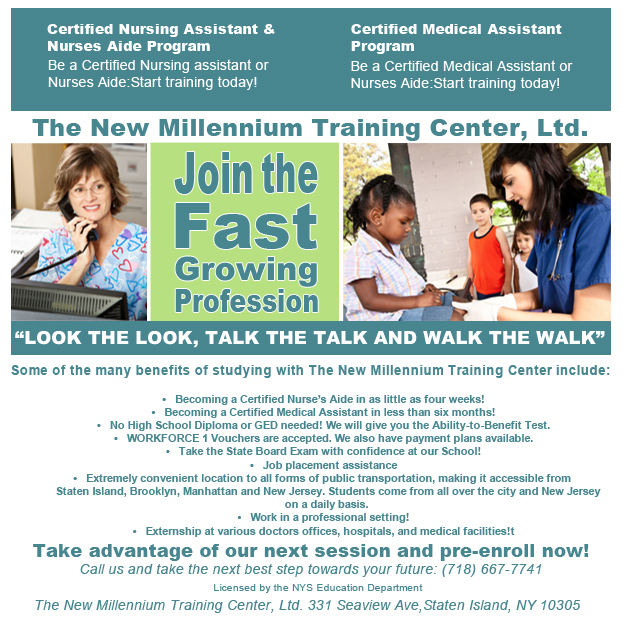 In addition The New Millennium Training Center will assist you in preparation for your written Medical Assistant Examination. There is no clinical state board examination. The Certification Exam is completely voluntary on your part and is not mandatory. All students must attain a 80% average in classroom theory and attain a satisfactory completion of all training. Once I complete my Medical Assistant course what is the next step? Upon completion of Medical Assistant curriculum, the student will receive a certificate of completion and will then be eligible to take the examination to be a Certified Medical Assistant. Successful completion of the examination requirements qualifies the student to take the New York State Department of Health's Registry Exam to become a Registered Medical Assistant (R.M.A.). After receiving a Medical Assistant certificate from The New Millennium Training Center, a graduate is then qualified to pursue a variety of opportunities in the medical field. Such opportunities may include, but not be limited to, employment in a Doctor's office, a small to large size Medical Group, Medical Clinics, Dispensaries, and Hospitals. Upon completion of the Medical Assistant course, the student will be able to perform medical and office administrative duties on an entry-level basis at first and then will gradually increase their delivery skills as time goes by. Included in the course curriculum are clinical procedures such as preparing patients for examination, taking blood pressure, pulse and respiration, sterilizing instruments, taking electrocardiographs, readings and giving injections as well as phlebotomy procedures. Office and receptionist procedures such as basic billing, transcription, computer word processing, insurance forms as well as medical terminology and an introduction to CPT/ICD-10 coding, are taught in theory as well as practice. These days, all computer work is simplified and usually just a matter of following online or program instructions. Usually computer wok is as simple as going online to read and send emails.